B.Sc. Technion, 1971. M.Sc. Tel Aviv U., 1975. Ph.D. Stanford U., 1980. 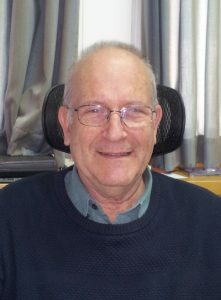 Engineer and Head of Dynamics and Loads at Israel Aircraft Industries, 1971-1977 and 1980-1987 respectively. National Research Council Senior Research Associate at NASA/Langley Research Center, 1987-1988. At Technion since 1988. Professor since 1999. Sanford Kaplan Chair in Aeronautical Engineering. Fellow of the American Institute of Aeronautics and Astronautics. Aeroelasticity and structural dynamics, interaction with control systems, design methods. Karpel, M., “Time Domain Aeroservoelastic Modeling Using Weighted Unsteady Aerodynamic Forces”, Journal of Guidance, Control, and Dynamics, Vol. 13, No. 1, 1990, pp. 30-37. Karpel, M., “Multidisciplinary Optimization of Aeroservoelastic Systems Using Reduced-Size Models”, Journal Aircraft, Vol. 29, No. 5, 1992, pp. 939-946. Karpel, M. and Raveh, D., “Fictitious Mass Element in Structural Dynamics”, AIAA Journal, Vol. 34, No. 3, 1996, pp. 607-613. Journal of Aircraft, Vol.36, No. 1, 1999, pp. 146-155. Raveh, D.E. and Karpel, M., “Structural Optimization of Flight Vehicles with Computational-Fluid-Dynamics-Based Maneuver Loads”, Journal of Aircraft, Vol. 36, No. 6, 1999, pp. 1007-1015. Karpel, M., Moulin, B. and Chen, P.C., “Dynamic Response of Aeroservoelastic Systems to Gust Excitation,” Journal of Aircraft, Vol. 42, No. 5, 2005, pp. 1264-1272. Gold, P. and Karpel, M., “Reduced-Size Aeroservoelastic Modeling and Limit-Cycle-Oscillation Simulations with Structurally non-Linear Actuators,” Journal of Aircraft, Vol. 45, No. 2, 2008, pp. 471-477. Bernhammer, L. O., De Breuker, R., Karpel, M. and van der Veen, G.J., “Aeroelastic Control Using Distributed Floating Flaps Activated by Piezoelectric Actuators,” Journal of Aircraft, Vol. 50, No. 3, 2013, pp. 732-740.